I couldn't recommend working with Project6 more highly. For the Center for the Art of Translation, Project6 surpassed all of our expectations. Top San Francisco Bay Area graphic and web design firm Project6 Design is thrilled to announce that a recent website design launch has won three website design awards. The project won a gold medal in the W3 Awards and took home silver in both The Davey Awards and Communicator Awards. Project6 Design took two disjointed and underwhelming websites for the Center for the Art of Translation and tidied them into one intuitive, consistently branded ecommerce site. 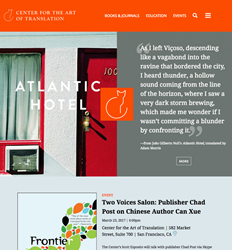 The challenge wove together books, journals, collections, events, and blog posts with their thousands (yes, thousands) of writers, translators, editors, and other contributors to truly feature the people behind the work. The new site synthesizes all interrelated content, dynamically updating contributor pages with links to their publications and vice-versa. Best of all, the site teases CAT's ecommerce publication offerings in an enticing and engaging way for all visitors. A WordPress content management system allows the Center for the Art of Translation the ability to quickly update their web content with ease and manage their inventory online. “Finding the right web design team is daunting. How can you feel confident about a decision that involves nearly every aspect of your organization's mission and vision? The Center for the Art of Translation is a 501(c)(3) nonprofit organization based in San Francisco that champions literary translation. The Center is dedicated to finding dazzling new, overlooked, and underrepresented voices, brought into English by the best translators, and to celebrate the art of translation. The Center's publications, events, and educational programming enrich the library of vital literary works, nurture and promote the work of translators, build audiences for literature in translation, and honor the incredible linguistic and cultural diversity of our schools and our world. The Winners of the 12th Annual W3 Awards have been announced by the Academy of Interactive and Visual Arts. 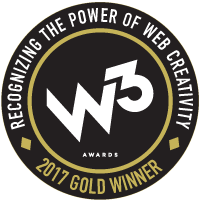 Receiving over 5,000 entries, the W3 Awards honors outstanding Websites, Web Marketing, Web Video, Mobile Sites/Apps & Social content created by some of the best interactive agencies, designers, and creators worldwide. “The creativity and quality of this season’s entries raised the bar once again. As our connected world continues to expand in new and exciting ways, our winners are a true testament to the power of Web creativity across the world.” said Derek Howard, the director of the AIVA. “On behalf of the over 750 members of The Academy of Interactive and Visual Arts, we applaud the talents and dedication our winners showcased and commend all of this year’s entrants for their commitment to furthering the quality of the content we view online.” Highlighting the diversity of entries and winners in this year’s competition, the 12th Annual Best-in-Show winners represent an impressive group of agencies and companies of all sizes. The W³ Awards honors creative excellence on the Web, and recognizes the creative and marketing professionals behind award winning Websites, Web Video and Online Marketing programs. Simply put, the W³ is the first major Web competition to be accessible to the biggest agencies, the smallest firms, and everyone in between. Small firms are as likely to win as Fortune 500 companies and international agencies.The W3 Awards is sanctioned and judged by the Academy of Interactive and Visual Arts, an invitation only body consisting of top-tier professionals from a "Who's Who" of acclaimed media, advertising, and marketing firms. The Communicator Awards is the leading international creative awards program honoring creative excellence for communication professionals. Founded over two decades ago, The Communicator Awards is an annual competition honoring the best in advertising, corporate communications, public relations and identity work for print, video, interactive and audio. The 2017 Communicator Awards received over 6000 entries from ad agencies, interactive agencies, production firms, in-house creative professionals, graphic designers, design firms, and public relations firms. The Davey Awards exclusively honor the “Davids” of creativity, the finest small agencies, firms and companies worldwide. David defeated the giant Goliath with a big idea and a little rock - the sort of thing small agencies do each year. The annual International Davey Awards honors the achievements of the "Creative Davids", who derive their strength from big ideas rather than big budgets. 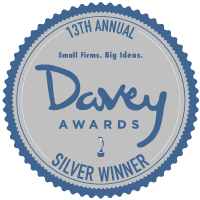 The Davey Awards is the leading awards competition specifically for smaller agencies as they compete with their peers to win the recognition they deserve. Project6 Design is an award-winning graphic design firm working with university, foundation, high-tech, and retail clients. Services include brand identity, marketing collateral, UI/UX design, website design, and website development. Working with national and international clients such as CrossFit, eBay, Gap, CA Technologies, Old Navy, and The Siebel Foundation, they are known as one of the best design firms in the San Francisco Bay Area.